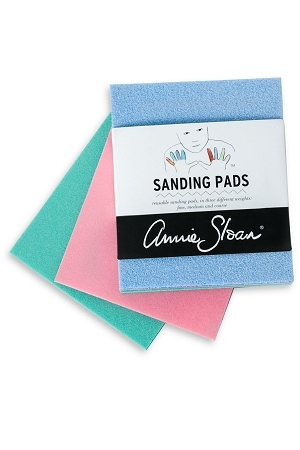 Sanding Pads by Annie Sloan. These come in a package of three. The top sponge is blue and it is the course. The red sponge in the middle is a medium grit and the green sponge is the fine grit. They are awesome used both either when dry or ,,,here is a great secret on how to use them.... lightly moisten the sanding sponge with water. It should NOT be dripping wet...just lightly moist! So, get them wet and then squeeze out all excess water! Then go over the dried chalk paint and "polish" the surface a bit...... this will knock down some of the surface tension of the peaks of the brush strokes and will NOT create any dust. Try it- you will love it! They are about a 6.5" long and maybe 4.5 inces wide. I cut them in half so they fit in my hand better. They are $10 for the bundle and there is NO color transfer.